One of the most lively and contentious issues in contemporary linguistic theory concerns the elusive boundary between semantics and pragmatics, and Professor Laurence R. Horn of Yale University has been at the center of that debate ever since his groundbreaking 1972 UCLA dissertation. 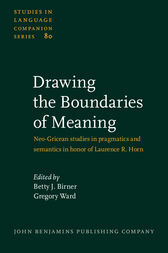 This volume in honor of Horn brings together the best of current work at the semantics/pragmatics boundary from a neo-Gricean perspective. Featuring the contributions of 22 leading researchers, it includes papers on implicature (Kent Bach), inference (Betty Birner), presupposition (Barbara Abbott), lexical semantics (Georgia Green, Sally McConnell-Ginet, Steve Kleinedler & Randall Eggert), negation (Pauline Jacobson, Frederick Newmeyer, Scott Schwenter), polarity (Donka Farkas, Anastasia Giannakidou, Michael Israel), implicit variables (Greg Carlson & Gianluca Storto), definiteness (Barbara Partee), reference (Ellen Prince, Andrew Kehler & Gregory Ward), and logic (Jerrold Sadock, Francis Jeffry Pelletier & Andrew Hartline). These original papers represent not only a fitting homage to Larry Horn, but also an important contribution to semantic and pragmatic theory.